I recently purchased a black jet ski and knew that keeping it clean would be a challenge. However, I did not anticipate having water spots that would not clean-up with soap and water. This happened within the first few days of use. Is there a product that you recommend to clean these water spots without harming the gelcoat. Washing with soap and water is part of your problem, even with boat soap. Soap leaves a residue which holds minerals and makes the spots harder to remove. Think about soap scum in the shower at home and how difficult that is to remove without damaging the finish, especially on plastic or fiberglass finishes. Water contains calcium and magnesium and when this dries on your boat it leaves spots which are hard to remove. Another problem that you will have to deal with very soon is fading and chalking of the black finish from the sun. A good solution for you is Kwik Shine. Simply spray it on the black fiberglass at the end of the day, wipe away the spots and any dirt or grime you may have picked up. When the Kwik Shine dries to a fine haze, wipe away the haze and you will have a mirror finish on your boat that will also protect against UV damage. 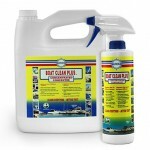 It will clean, protect and shine your boat in one easy application. It’s easy to do and can be done in a few minutes. Just be careful; on a black boat the shine will be so brilliant you will need to wear sunglasses to protect your eyes. If you have a matching truck, you can use Kwik Shine on the truck as well. Other products that are popular with Jet Ski owners are VS721 for below the waterline and Vinyl Guard to protect the saddle. The VS721 will seal the gelcoat against osmosis blisters, increase the performance of the boat, make it easier to haul and launch and make it easier to keep clean. Vinyl Guard will bullet proof the vinyl seat, without making it greasy or slippery and increase the life of the seat.